The Warden depot was built to the Milwaukee Road "Class A" depot plan. 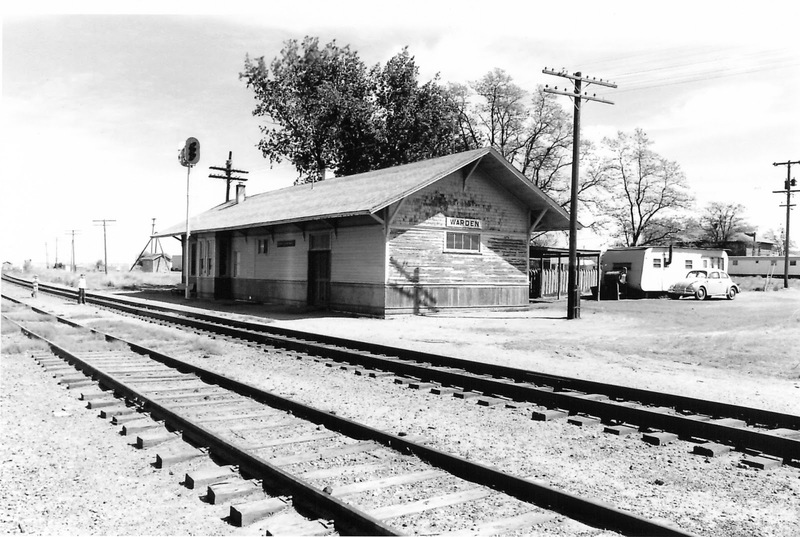 Marcellus and Moses Lake were extended and slightly modified versions of this depot. Warden was 24 feet wide by 76 feet long, the standard depot size being 24'x44' with varying freight room length; Warden's being 32 feet long. The depot contained basic living quarters for the agent and his family. The old semaphore style train order signal has been replaced with a color-light type, but it appears the signal head was attached to the top of the original mast. By the looks of the trailer out back, it would appear that the agent has moved out of the building and into his own domicile. The depot was closed May 27, 1975 and the agent bumped onto another agency.